I've always been a lover of books. I can remember as a little girl staying up way past my bedtime, secretly reading in my room. When I got to the age of chapter books, my mom got me started on the American Girl Doll stories and I have been reading historical fiction ever since. Now that I am out of school, I can once again read for pleasure -- a delightful thing that has been rarely possibly for the last 6-10 years. At this point in my life, I really enjoy reading anything and everything about old Hollywood, classic movie stars and film, and anything vintage clothing related. While I still enjoy a good historical fiction novel, there is just something about peering into the fictional lives of vintage clothing store owners that brings a great sense of enjoyment to the act of reading. 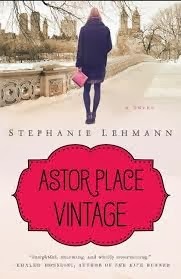 Astor Place Vintage, by Stephanie Lehmann, is the story of Amanda, a 30 something vintage clothing store owner in New York City. The novel opens with her on a buying appointment (which quickly drew me in for so many reasons) where she discovers the journal of a young woman, Olive, who is chasing a department store buyer position. The novel then alternates between these two narratives, eventually expressing how these two women, while separated by time, are ultimately intertwined. The entire premiss of the novel revolves around the notion of what one can find hidden amongst old clothing and really what can be found with relics of the past. Amanda unearths this journal, begins to read it, and the rest of the novel follows by witnessing these two women's lives and how Amanda connects with this journal. This notion of found objects impacting a person's present is the real charm of Astor Place Vintage. Within the first few pages of this novel, the reader is indoctrinated into the world of a vintage treasure hunter and Lehmann does an excellent job of crafting this world within the text of her novel. I highly recommend this book to all vintage lovers, but especially those who deal in and love vintage clothing. Find out more about the book HERE. I just picked mine up at the library yesterday and I can't wait to get reading! Have you read Alligators, Old Money and New Mink? that's a fun one about vintage clothing too. It was written by a woman who had a vintage clothing shop somewhere in NYC.